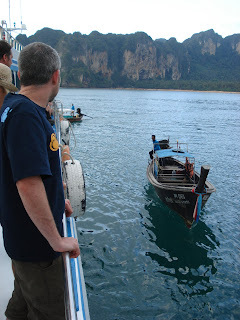 As our ferry from Phi Phi pulled up to Railay Beach, a longtail boat came out to meet us and bring us ashore. Or as far in as low tide would allow--we were left to wade in the rest of the way with our luggage on our backs. The empty beach that greeted us set a new relaxed tone for this Thailand stop. Railay is a small peninsula jutting out from Thailand's west coast, its towering limestone cliffs completely cutting it off from the rest of Krabi and making it feel more like a remote island. West Railay, where we first landed, is a long, welcoming strip of sand studded with a handful of unobtrusive waterfront resorts. Less than a ten minute walk along a paved pathway takes you to East Railay; the mangrove-dominated shore is murky, which matches the vibe of this very chill, almost too hip little outpost where the shrines were not to Krishna or Buddha but Marley. Restaurants with pillowed patios for reclining, bars built on stilts so when the tide dramatically came in we found ourselves lounging on top of the sea. And it was easy to relax with everything on the menu--from dinners to frilly cocktails--costing around $2-3 USD. 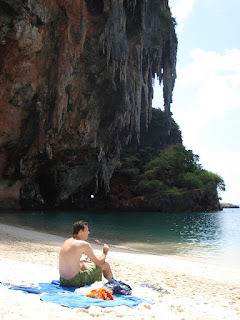 At the very tip of the peninsula was our favorite beach: Phra Nang. With protective limeston e citadels jutting out on one side and the sea flowing into the mouth of a cave on the other, the setting was spectacular. And the women selling fresh fruit, grilled corn, and the best chicken satay in Thailand from their personal barbecues made it an easy place to want to stay. Unfortunately the water was a bit prickly, full of some invisible jellyfish-like things that insisted on stinging us whenever we needed to cool down. This turned from nuisance to pretty unbearable as we drifted into the ovenesque temperatures of high noon, so we spent the rest of the day back at our hotel. Diamond Private Resort is a sprawling collection of bungalows up just about a million steps from East Railay. At the top of the towering, rickety staircase is their real gem: a delicious swimming pool that overlooks the ocean. We had it almost to ourselves the afternoon we were escaping the heat and sea life--and we were very appreciative to be able to park ourselves in water that didn't sting us. Our bungalow was far to the back of the resort, behind the newer, more elegant looking facilities, but we got a great deal paying $24 USD/night for a huge if simply furnished room and access to that pool. Our stay in Railay happily coincided with Loy Krathong, a holiday celebrating the full moon of the 12th month of the lunar year. Like Diwali in India, the festivities were all about lights. Every restaurant in town was doing something to celebrate and we chose to spend the evening at our new favorite: The Last Bar (named so because it is literally the last bar at the end of East Railay). There were fire twirlers, a band--though we use that term loosely, and all the materials to make our own krathongs: small rafts of banana tree trunk adorned with stylized banana leaves, flowers, candles, and incense sticks. Katrina was shocked to see the heaps of orchids and other exotic flowers free for the taking like tortilla chips at a cantina (anyone else who has recently planned a wedding will understand). It was clear that everyone else, like us, was very proud of their personal creations, and tenderly displayed them on their tables throughout the evening. 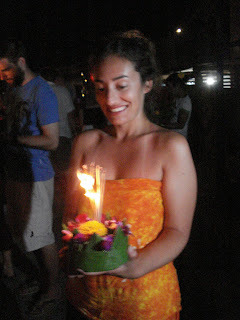 Just after midnight we all lined up to light the candles and incense, make a wish, and set our krathongs asea. 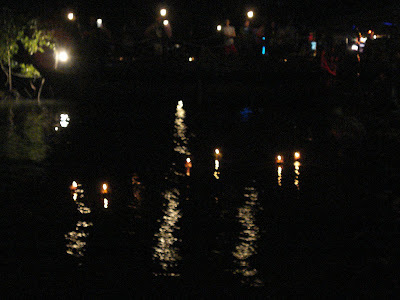 It was really special to watch everyone's glowing, flower-laden wishes light up the ocean. It was a little sadder the next morning seeing the dilapidated, wave-beaten remnants bobbing around on our longtail boat ride to the mainland. Krabi Town is not much to speak of on its own, with a small city center whose highlight for us was the Italian-owned Pizzeria Firenze. There is a small night market that closes down around 9pm, probably so that they can rest up and get ready for what is supposedly the largest morning market in the region--unfortunately for us we did not manage to tear ourselves out of bed before 8am. We were completing our non-AC experiment with a fan only room at Good Dreams Guesthouse. Verdict: what were we thinking? View more pictures from Krabi here. Thank you for this infomation. I really love travelling and always happy to get such type of information. I always book my flight through ECT. Hey, Should have got out of bed :-) It`s probably just like another other morning market, but seeing those piles of chilies makes your knees tremble. Thank you for sharing!! Can you please tell me if you actually had any suitcases (or just backpacks) I'm going to travel solo and really want to carry a suitcase - is it manageable? ?